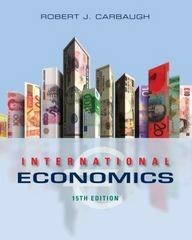 International Economics 15 Edition Now in its 15th edition, this proven, market-leading book remains a favorite among readers of all backgrounds for its clear, concise treatment of international trade and finance theory. Using a wealth of contemporary examples and practical applications, INTERNATIONAL ECONOMICS vividly demonstrates the relevance of theory to real-world economic issues and policy questions. Discussions are presented both verbally and graphically, making the book highly accessible even if you have little economics background. As you will soon discover, "If it's clear, concise, and contemporary, it has to be Carbaugh!"